Tuesday April 23 – CLUB CLOSED – we are all dancing at the National in Deloraine, Tasmania. It is opposite Brandon Park Shopping Centre, behind the fire station. There is plenty of parking, and the hall is a good size for our club. Tuesday 30 April – Mike and Laurina are still in Tasmania, so Don Moxey will be running the night with the help of Mike’s evil twin – TYKE. If you haven’t met TYKE before, you are in for a treat! 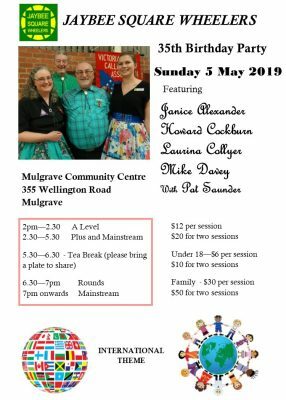 Sunday 5 May – Jaybees’ 35th birthday at Mulgrave Community Centre, 355 Wellington Road, Mulgrave, commencing at 2pm with A level. Mike’s PLUS – Mike will be teaching Plus every Thursday night, commencing 9 May 2019 from 7pm, at the Girl Guide Hall in Bogong Reserve, opposite 70 Bogong Avenue, Glen Waverley. If you are interested in learning PLUS or refreshing your skills, come along and have some fun. Mike Davey – our very talented Square Dance Caller. He has a very easy voice to listen to and he manages to give us choreography that can easily tie us up in knots! Pat Saunder – our Round Dance Cuer. We are lucky to have a resident Cuer and Pat has taught round dancing to most of our dancers, so we can all get up and waft around the floor.